Contrary to what you might think, higher-income households are actually less likely to be burglarized, according to an analysis by the Department of Justice. So folks of lesser means are not only at greater risk of being ripped off, they’re also less able to afford a home-security system. The team at Canary doesn’t think that’s fair, and they’re working on a device that could level the playing field. The company launched a crowd-funding campaign on Indiegogo today to bring its inexpensive home-security system—also called Canary—to market. I spoke with Canary’s CEO, Adam Sager, about the new product last week. Sager, a former sergeant with the Israeli Defense Forces, provided security consulting services to a number of large corporations before cofounding Canary. Canary is jam-packed with digital sensors. The six-inch-tall Canary features an IP camera and a broad array of sensors. As Sager points out, one of the reasons these types of systems are so pricey is that they rely on placing expensive sensors all over the house, which are connected to a costly central control panel. Canary is an all-in-one system that Sager says can be set up in just 30 seconds and will cost just $199. While the system will have a connection to the cloud, there will be no monthly service fees tied to the device—unless you want additional features, such as 24/7 central-office management for dispatching police and fire personnel if the system can’t reach you (most insurance companies will discount your policy if you have an alarm system with that capability). 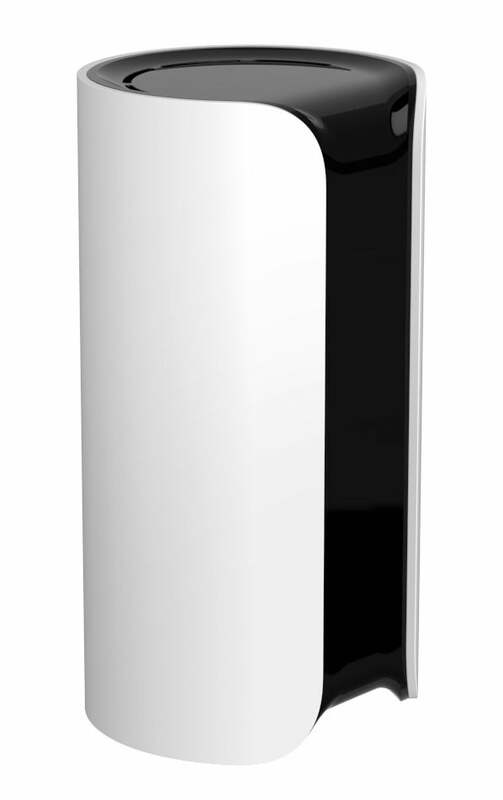 Canary is a cylindrical device that’s jam-packed with an array of digital sensors, plus an IP camera that can see in the dark, a microphone, a 100-decible siren, and an 802.11 b/g/n Wi-Fi adapter for connecting to your home network. Although it measures just six inches tall by three inches in diameter, Canary also houses an air-quality sampler, a motion detector, a three-axis accelerometer, a humidity sensor, and a temperature gauge. Similar to the Nest learning thermostat, Canary will feature algorithms that learn about and adapt to activities inside your home. Using geolocation data from your smartphone, it will be able to tell you who's at home at any time. And its motion detector will learn to differentiate humans from pets, so that it can alert you when it senses someone is in the house when you expected it to be empty. 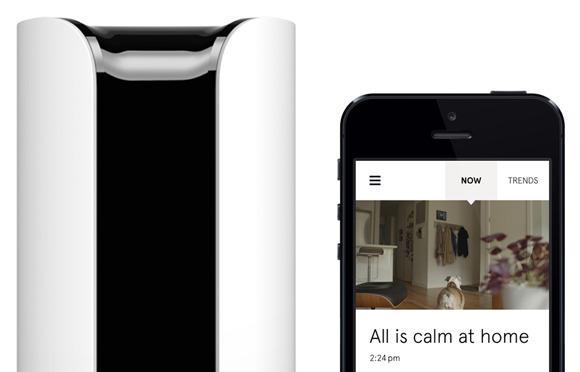 Canary's motion sensor and algorithms will learn to differentiate between you and your pets. But you’ll also be able to manually program the device using Canary’s web portal. As Canary monitors events and records data, it will upload this information to a server in the cloud. The server will then be able to relay information about what’s happening in your home to your smartphone. 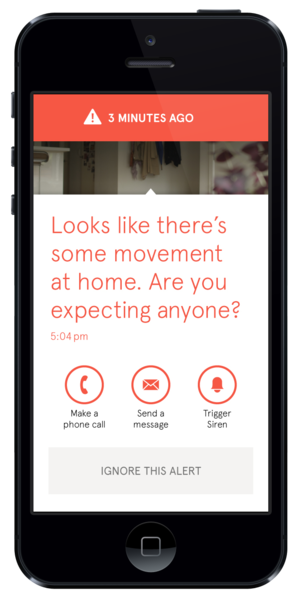 As a security device, Canary can be armed while you’re away and disarmed when you’re home. It will also have a third state for when you’re inside the home, but you still want security. In this mode, its sensors will evaluate only certain events, such as very loud noises. Sager claims the Canary’s mic will be sensitive enough, and its accompanying algorithms sophisticated enough to differentiate between a door slam and a person screaming and will respond accordingly (setting off its siren and sending you an alert, for instance). And while Canary’s air-quality sensor won’t pass regulatory muster as a smoke or carbon monoxide detector, it will be capable of reacting to alarms and sirens from devices that do. The temperature sensor could also alert you to a rapid increase in temperature indicating the probability of a fire. And while the Canary’s humidity sensor won’t be capable of detecting a leaking water pipe, it could alert you if the house becomes flooded. The accelerometer will be able to detect rapid movement, such as might occur if an intruder tried to disable the Canary, but it will also be capable of sensing vibrations in the home. Hmm. It would be interesting to see if it could detect earthquakes. For now, Canary will not be capable of interacting with other systems in your home, such as your lighting, door locks, and HVAC. So unlike other inexpensive home-control systems now on the market, such as Nexia Home Intelligence or Lowes’ Iris, you won’t be able to trigger lights to turn on when you open a door, remotely unlock your door using your smartphone, or program your thermostat over the Internet. On the other hand, the manufacturers of those systems expect you to pay a monthly fee, and Sager maintains Canary will have no subscription fees unless you choose options such as additional cloud storage or the aforementioned central-office monitoring. I do see some other limitations in this device, but Sager maintains they’re mostly conscious choices to keep the cost down. Most important of these is that Canary relies on AC power and has no battery backup (Sager says all the onboard sensors would drain too much power from a battery). If your power fails or you router goes offline, so does your security system (unless you plug both into an uninterruptible power supply, which is not at all a bad idea). If someone breaks in and disables it, you can hope that they were in view of the camera at the time. 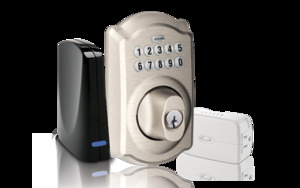 Today’s more sophisticated security systems rely on cellular connections, so that a burglar can’t cut power to the home to disable them. In the event Canary loses contact with the cloud server, however, Sager says it will send you an alert that the system is down. Aside from those quibbles, Canary looks extremely promising. While it’s being positioned as a security solution for the masses, Sager says owners of larger homes will be able to deploy up to four of the systems and they’ll all work together. The anticipated price tag is less than some IP cameras alone, and the absence of a monthly service fee renders it doubly affordable. And unlike traditional security systems, you can take the Canary with you when you move. Canary has built a working prototype, which I haven't evaluated, and has a modest funding target of $100,000 to be used for for tooling and production. The company is offering early-bird investors one device for $149 (additional units will be available at the anticipated retail price of $199). So the idea is solid, but the path from a great idea to manufacturing a great product is long, and Canary's three founders don't appear to have a lot of manufacturing experience under their collective belt. Personally speaking, I wouldn't trade my whole-home security system with its many door and window sensors for a Canary. I like having IP cameras all over the house, and I like that my alarm system ties into my entry locks, lighting, and HVAC system. Having said that, I still think Canary is one of the best ideas in home security I've seen in a long time, and I think a lot of people will like it enough to invest.